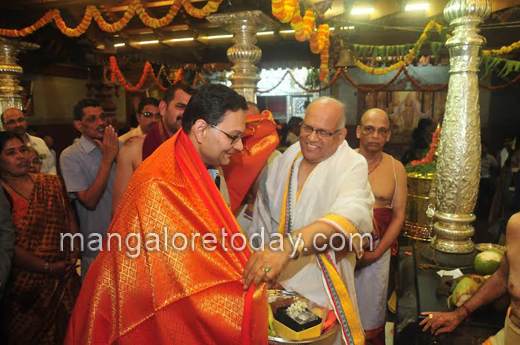 Mangaluru, Feb 13, 2016 : Chandra Kumar Bose, the grandson of renowned freedom fighter Netaji Subhas Chandra Bose visited the Shree Venkataramana Temple at Carstreet here which is celebrating its Car Festival, and offered prayers to the Lord. 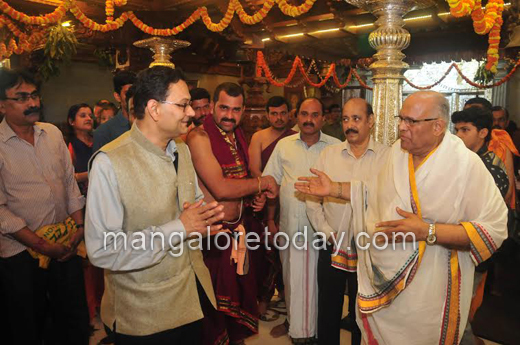 Mangalpady Naresh Shenoy, Convenor of Yuva Brigade, Padmanabha Pai, Trustee of the Temple and others were present. As we have read and heard about Susbhash chandra bose but His grandson visit to Manglore is our pleasure.Its the genes which passes on and we get to see some similar feature in the looks which reminds of him. Its great to see the grandson of our freedom fighter. A warm welcome Mr.Bose.